The time has come for Pharo 7.0! This is our most significant release yet. Pharo is now provided in 64-bit version in Linux and OSX and brings even better performance and stability. The 64-bit version is now recommended for Linux and Mac, and is provided as technical preview for Windows. Pharo comes with a new version of the PharoLauncher (https://pharo.org/download): THE tool to manage your distributions (access to regular versions, jenkins builds, and older versions). Pharo build has a fully new build process that supports its full bootstrap from sources. This will enable the production to specific (micro) images. Iceberg, the git client for Pharo has been significantly improved, and is the default VCS. Calypso, the angular stone of PharoThings, is the new system Pharo browser. It replaces Nautilus and brings better remote working and more advanced browsing capabilities. IoT is now an important part of Pharo. Installing PharoThings (https://github.com/pharo-iot/PharoThings) provides an impressive amount of tools to develop applications in small devices. The unified foreign function interface (UnifiedFFI) for interfacing with the outside world is significantly improved to work properly on Windows 64-bit. 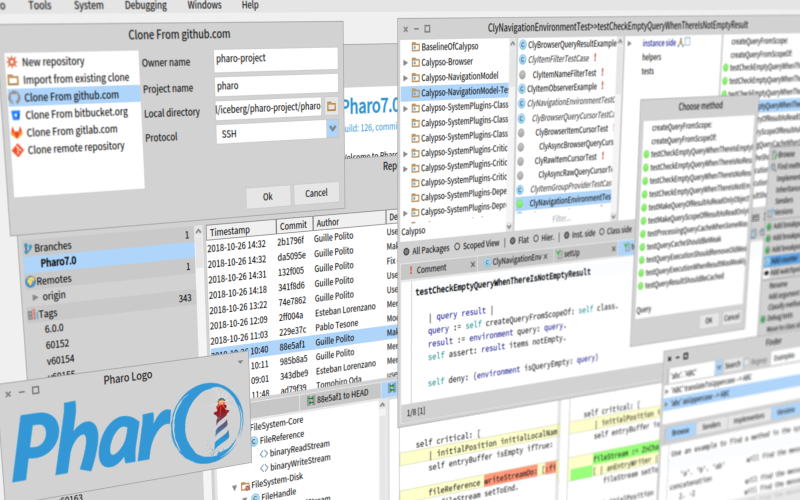 Pharo 70’s new infrastructure and process set the stage for a new generation of version. The visibility of GitHub combined with the powerful tools that have been validated with more than one year of beta testing is massively pay off. These are just the more prominent highlights, but the details are just as important. We have closed a massive amount of issues: 2142 issues! (A comprehensive ChangeLog can be found here). While the technical improvements are significant, still the most impressive fact is that the new code that got in the main Pharo 7.0 image was contributed by more than 75 people. Gabriel Omar Cotelli, Gustavo Santos, Marcus Denker, Torsten Bergmann, Esteban Lorenzano, Bernardo Ezequiel Contreras, Guille Polito, Pablo Tesone, Yoan Geran, Stéphane Ducasse, Cyril Ferlicot, Vincent Blondeau, Denis Kudriashov, Julien Delplanque, Tim Mackinnon, Max Leske, Andrew P. Black, Clément Béra, Ben Coman, Eric Gade, Yuriy Tymchuk, Nicolas Cellier, Biyalou-Sama Asbath, Myroslava, Sean DeNigris, Juraj Kubelka, Noury Bouraqadi, Holger Freyther, Geoff Reedy, Norbert Hartl, Paul DeBruicker, Alain Plantec, Martín Dias, Peter Uhnak, Tomohiro Oda, Benoît Verhaeghe, Santiago Bragagnolo, Wouter van Zuilen, Bernhard Pieber, Damien Pollet, Geoff Hill, Hans-Martin Mosner, Ronie Salgado, Philippe Back, Aliaksei Syrel, Dayne Guerra, Rafael Luque, Serge Stinckwich, Vincent Aranega, Hernán Morales Durand, Petr Fischer, Rajula Vineet Reddy, Alexandre Bergel, Esteban A. Maringolo, Jan Blizničenko, Johan Brichau, Luc Fabresse, Quentin Ducasse, Sébastien Roccaserra, Stephan Eggermont, Sven Van Caekenberghe, Takano Mitsuhiro, Pavel Krivanek, Allex Oliveira, Christophe Demarey, Lionel Akue, Nicolai Hess, Martin McClure, Alistair Grant, Pierre Tsapliayev, Milton Mamani, Matteo Marra, Thomas Dupriez, Asbathou Biyalou-Sama, Henrik Nergaard. (If you contributed with Pharo 7.0 development in any way and we missed your name, please send us a mail and we will add you).